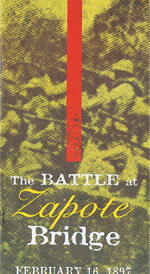 The Battle of Zapote Bridge was fought on Febraury 16, 1897 between 3,000m Americans and 5,000 Filipinos. It was the second largest battle during the Philippine-American War. General Edilberto Evangelista is a prominent figure in this battle. A Belgian-trained engineer, he taught the Katipuneros how to build trenches, batteries and pillboxes. His designs were instrumental in a number of Filipino victories around the Cavite province. Zapote River separates the City of Las Piñas in Metro Manila from Bacoor in the Province of Cavite. The original Zapote Bridge was hit during the battle, causing one-half to collapse. The office of Congresswoman Villar funded the restoration of the half of the bridge, to become a pedestrian promenade, which connects Barangay Zapote, Las Piñas to Barangay Zapote in Bacoor, Cavite. Monument parks were established on both ends of the bridge: through Congresswoman Villar’s intercession, the Basa family allowed the erection of a monument by sculptor Ed Castrillo on their property in the Las Piñas side; while a monument depicting the Battle of Zapote Bridge was established in Bacoor by the Philippine Tourism Authority under the leadership of then General Manager Barbers, upon the request of Senator Manny Villar, who also funded the rehabilitation of the barangay hall to follow 18th century architecture. In February 1997, on the centenary of the historic battle, the Villar SIPAG coordinated with the local governments of Bacoor, Cavite and the City of Las Piñas, the National Centennial Movement and the Department of Education in order to orchestrate the celebration, which included a parade and a street drama based on the events of 1896-1897 highlighted by the reenactment of the Battle of Zapote Bridge. Participants and guests came dressed in turn-of-the-century regalia. Crisanto, Joyce M. & Chit dela Torre. Las Piñas: A City with Heritage. Las Piñas City, Philippines: Villar SIPAG, 2006.